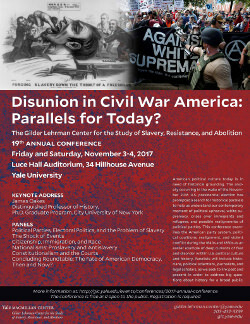 This public panel, which marks the Yale Repertory Theatre’s production of Suzan-Lori Parks’s Father Comes Home from the Wars (Parts 1, 2 & 3), will discuss the ways in which theatre seeks to make sense of the present condition by mining America’s shifting conceptions of race and gender, its violent history of slavery, and its unfilled promises of freedom. 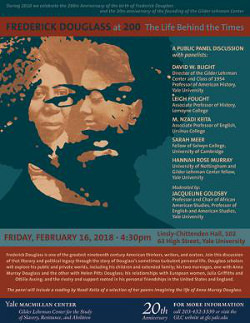 Moderated by Professor Daphne Brooks and bringing together historians, theatre studies scholars, and theater professionals, the panel will consider both Suzan-Lori Parks’s play as well as broader questions involving the ways in which playwrights and historians have creatively engaged with America’s past to better understand slavery, freedom, gender, and race. 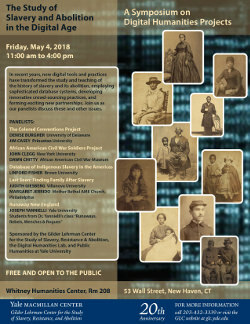 In recent years, new digital tools and practices have transformed the study and teaching of the history slavery and its abolition, employing sophisticated database systems, developing innovative crowd-sourcing practices, and forming exciting new partnerships. Join us on Friday, May 4th as our panelists discuss these and other issues. 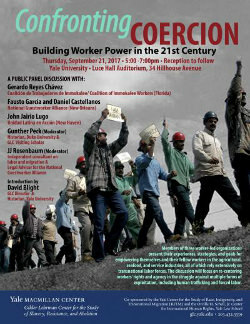 At the crux of America’s history stand two astounding events: the immediate and complete destruction of the most powerful system of slavery in the modern world, followed by a political reconstruction in which new constitutions established the fundamental rights of citizens for formerly enslaved people. Few people living in 1860 would have dared imagine either event, and yet, in retrospect, both seem to have been inevitable. 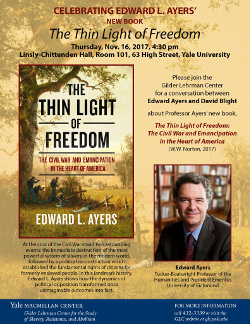 In a beautifully crafted narrative, Edward L. Ayers restores the drama of the unexpected to the history of the Civil War. He does this by setting up at ground level in the Great Valley counties of Augusta, Virginia, and Franklin, Pennsylvania, communities that shared a prosperous landscape but were divided by the Mason-Dixon Line. From the same vantage point occupied by his unforgettable characters, Ayers captures the strategic savvy of Lee and his local lieutenants, and the clear vision of equal rights animating black troops from Pennsylvania. We see the war itself become a scourge to the Valley, its pitched battles punctuating a cycle of vicious attack and reprisal in which armies burned whole towns for retribution. 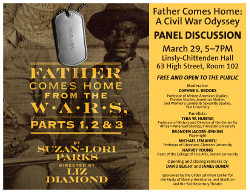 In the weeks and months after emancipation, from the streets of Staunton, Virginia, we see black and white residents testing the limits of freedom as political leaders negotiate the terms of readmission to the Union.